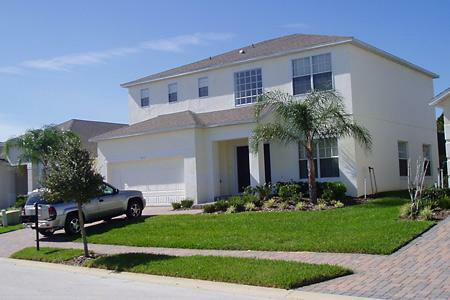 This beautiful spacious villa is located in the private gated community of Sanctuary at Westhaven and close to Champions Gate and Reunion Golf Courses and just 15 minutes from Disney. 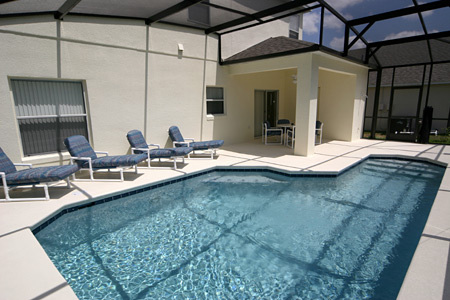 The Villa has its own private screened west facing pool ideal for relaxing after a hard day at the parks. Family Room Family lounge with cable T.V. situated close to the kitchen and with a view of the pool area. Living Room A cosy "chill out" lounge ideal for escaping the family for a few minutes peace and quiet. Dining Room A dining area ideal for more formal occasions or can be used for larger groups when needed. Kitchen Large spacious kitchen with central island unit equipped for all your culinary needs. Informal dining area ideally situated next to the kitchen for day to day use. Master Bedroom Large King size bed with en-suite shower and bath facilities. Fully fitted wardrobes and T.V. Bedroom 2 Second large queen size bed with en-suite bathroom facilities. Fully fitted wardrobes with T.V. Bedroom 3 Spacious twin bedroom with fitted wardrobes and T.V. Bedroom 4 Spacious twin bedroom with fitted wardrobes and T.V. Games Room Games Room consisting of Pool Table, Air Hockey Table, Foosball Table and a sofa for the kids to chill on. Pool West facing private screened pool with decking area and lanai. Comfortably equipped for relaxing and sunbathing.